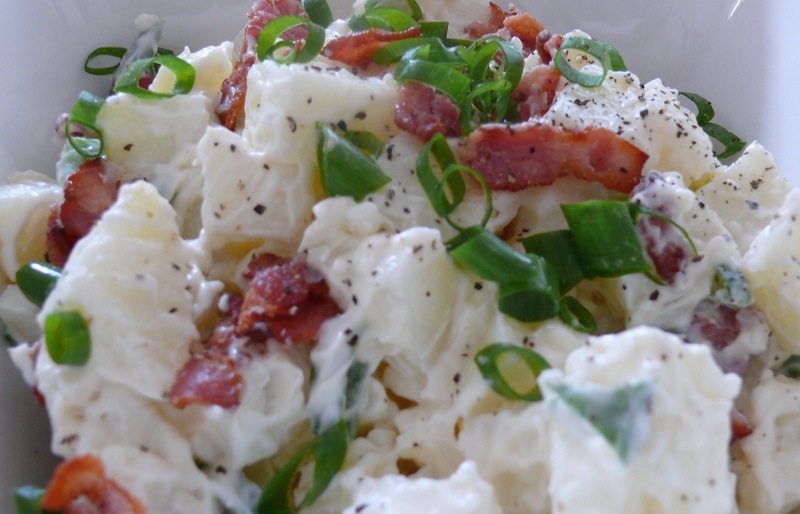 I’ve posted a potato salad in the past. Made with Easy As Homemade Mayo and flavoured with mustard. I also touched on how cooked and cooled potatoes are a source of resistant starch which is great for feeding your good gut bugs. Well, here is another take on this delicious salad using a couple of my favourite ingredients, bacon and shallots. There are some who shun potatoes, perhaps finding them a too carby, or have an intolerance and to be honest, I don’t recommend eating this salad every night either. 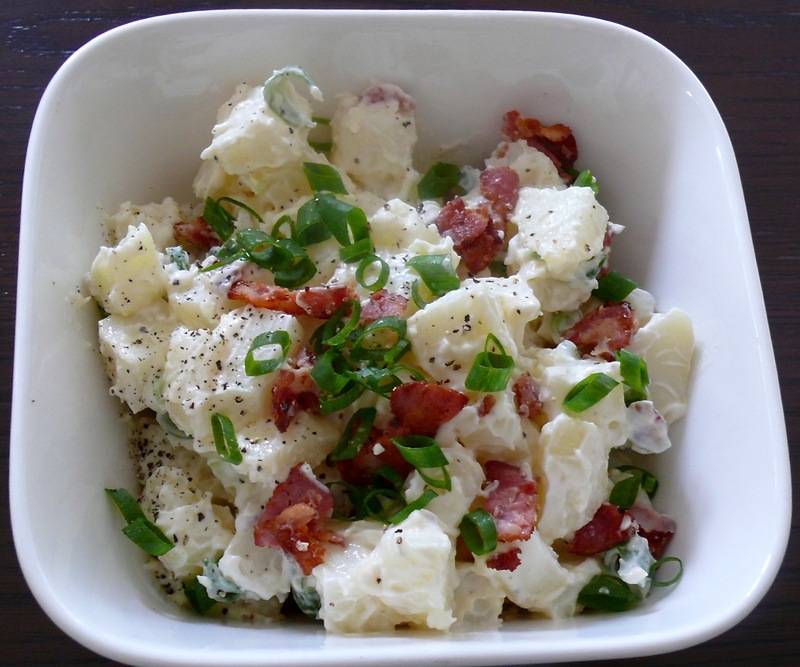 But as a side to a perfectly cooked juicy steak, I think that Potato & Bacon Salad is pretty hard to beat. Peel, slice and cook potatoes then cool. Fry bacon and cool. Add mayonnaise to potatoes and mix well. Add the finely chopped shallots, sliced spring onions and chopped bacon. Mix to combine then add final sprinkle of bacon, spring onions and pepper. 4 rashers of streaky bacon, cut to prefered size. Prepare the Mayonnaise and cool. 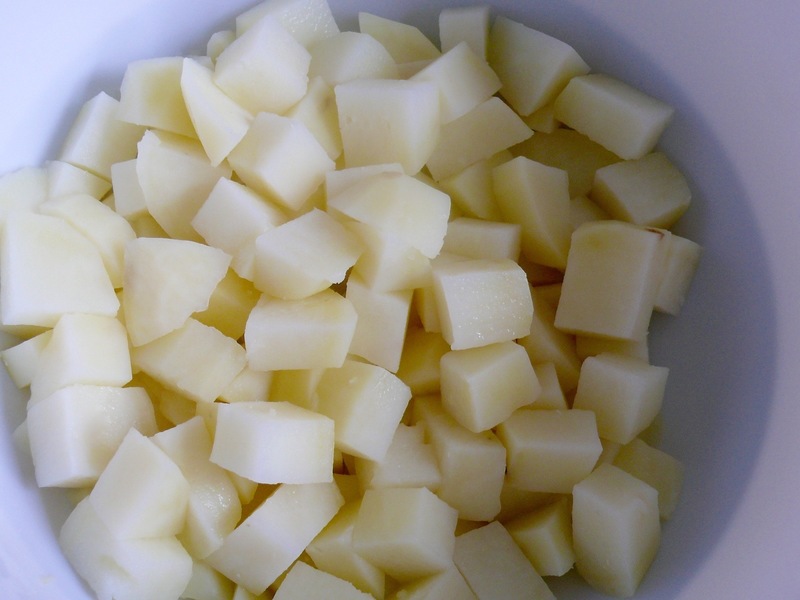 Peel and slice the potatoes into small bite sized squares. Size is a matter of taste, if you like the potato in your salad large then make them large. Just make all the pieces roughly the same size so they are all cooked at the same time. Place your potatoes in a pot of cold water add the salt cover and bring to the boil. Simmer until tender. Take care to watch them as they can easily cook to mush! Chop your bacon to bite sized pieces. Melt butter/ghee or coconut oil, and fry bacon on a medium heat until cooked. Place on a paper towel and cool. 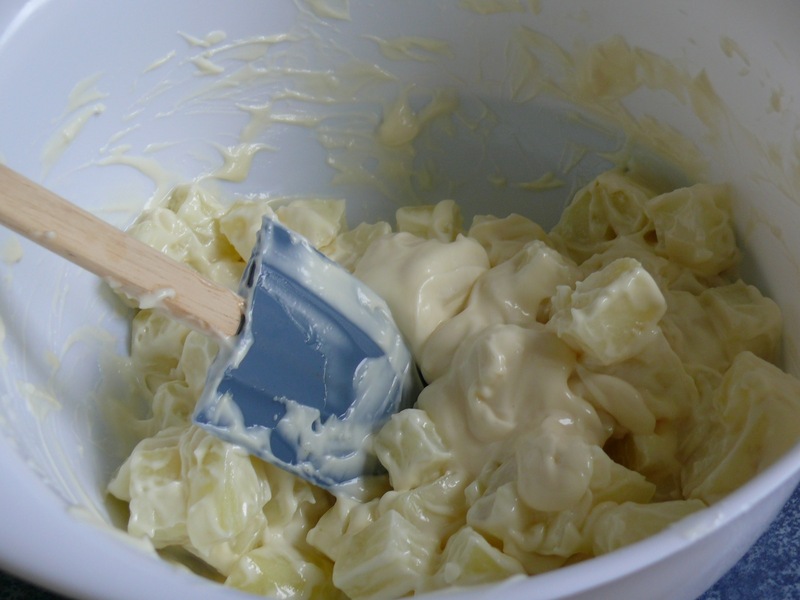 Add prepared mayonnaise to potatoes and mix through gently. Slice your spring onions (scallion) and chop shallots finely. Taste for seasoning adding salt and pepper as needed. Finally add the remaining bacon and spring onions. Serve with your favourite grilled steak! Easy As Mayonnaise – makes one cup. In a food processor pulse the egg, vinegar/lemon juice and salt until frothy. Turn the food processor onto its highest speed and very, very, very slowly start dribbling in the olive oil. It’s very important to take your time over incorporating the oil into the egg mix. Keep dribbling and then slowly start pouring the oil until it is all mixed. At this point your mayonnaise will be thick and ready to go. Store in an airtight container in the fridge – can keep well up to 5 days.